A carbon nanotube can produce a very rapid wave of power when it is coated by a layer of fuel and ignited. (CNN) -- It's so tiny, you can't see it with the naked eye. It works like this: Researchers used tiny wires, known as carbon nanotubes, to create a powerful wave of energy, according to Michael Strano, and MIT associate professor of chemical engineering. He is also the senior author of a paper on this new phenomenon, published in this week's Nature Materials journal. "This could lead to batteries that are up to 10 times smaller and still have the same power output. In the portable energy and energy conservation arena, we're trying to find power sources that have a smaller profile but hold more energy," Strano told CNN Radio. To build a power source, such as a battery, it's necessary to move electrons in a material from one end of the battery to the other, creating an electrical current. 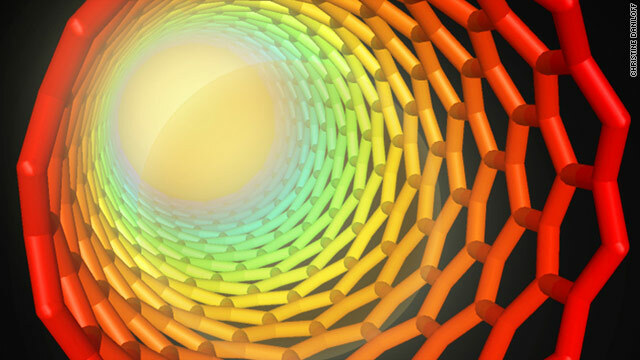 This thermopower wave MIT researchers discovered, using the class of molecules know as carbon nanotubes, does just that. Strano said "some of the advantages of this technology [are] you can generate a lot of power from a very, very small device." And that's not all. Most batteries on the market now are made from highly toxic heavy metals, which are very bad for the environment -- metals like lead, nickel and cadmium. "The materials we use to make these thermopower waves are organic. They're not grown naturally, but they're made of carbon. In other words, you could essentially incinerate them, or they would degrade over time, there's no heavy metal residue," Strano said. There's another potential benefit in using a so-called thermopower battery: energy savings. "Most people don't realize a battery sitting unused in your laptop is leaking its power away," Strano said. "If you take all the laptop batteries that are produced in one year, in the off state, they're leaking an amount of power during that year that we could store in a small nuclear reactor ... and that's power that's essentially lost and dissipated just from laptop batteries." CNN's Richard Benson contributed to this report.